Medical science has come a long way…but using a 3D printer to save a baby’s life? Though it may sound absurd, doctors in Michigan did just that. Kaiba Gionfriddo was born with an incompletely formed bronchus (one of the two airways that connect the lungs to the windpipe). This condition, which affects about 2,000 U.S. babies annually, is rarely discovered at birth. For most babies, more tissue develops over time, and the condition corrects itself around age 2 or 3. But in severe cases, like Kaiba’s, the baby suddenly stops breathing. It is only then that parents learn of their child’s condition, and often, by that time, it’s too late. That was almost what happened to Kaiba when, at six weeks old, he accompanied his parents to a restaurant. “He turned blue and stopped breathing on us,” April Gionfriddo, Kaiba’s mother told CBC News. April said that the little boy’s father managed to revive him with CPR, but more episodes followed. 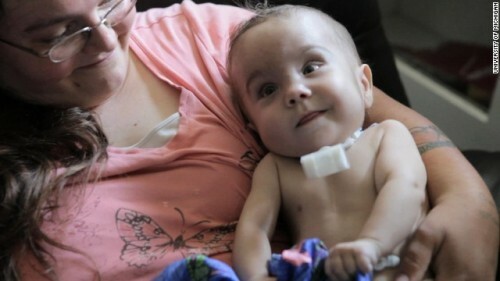 By the time he was two months old, doctors had placed him on a breathing machine. It was then that they delivered a very grim prognosis to Kaiba’s parents. Kaiba’s airway kept collapsing. Sometimes his heart stopped too. 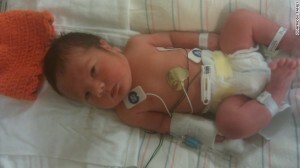 Without something to keep his airway open, it was only a matter of time before his parents lost him forever. But Marc Nelson, a doctor at Akron Children’s Hospital, suggested that they consider some experimental work that was being done in Michigan. There, doctors were testing airway splints made out of biodegradable polyester – a material sometimes used to repair bone and cartilage. Though they’d never actually implanted one of these splints, it seemed that they might be little Kiaba’s only hope. 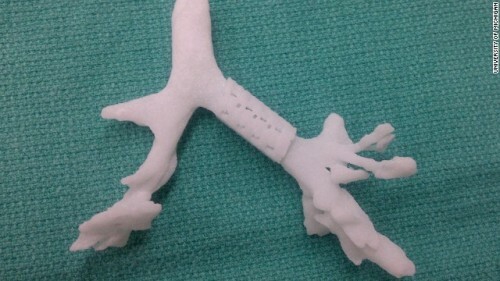 So, doctors in Michigan “printed out” 100 tiny tubes from a 3D printer. They used the computer-guided lasers to stack and fuse thin layers of plastic instead of paper and ink. They constructed various shapes and sizes, to try and find the perfect fit for Kaiba. After receiving special permission from the U.S. Food and Drug Administration, one of those tiny tubes was implanted into Kaiba. To keep it from collapsing, surgeons stitched the tiny tube to Kaiba’s defective bronchus and then placed the tube around it. And just like that, a little boy who wasn’t expected to leave the hospital alive was able to breathe normally for the first time in months. Even better, he hasn’t had a single breathing crisis since. In fact, he’s doing so well (now at 19 months old!) that doctors are getting ready to take out the tracheotomy tube that was needed to keep him alive while on his breathing machine. “He’s a pretty healthy kid right now,” Dr. Glenn Green, a pediatric ear, nose and throat specialist at C.S. Mott Children’s Hospital of the University of Michigan in Ann Arbor, where the operation was done, told CBC News. And, though it’s not as amazing as saving his life, the tube itself does some pretty amazing things. With a slit up its side, the tube actually grows with Kaiba’s body; that’s something a permanent, artificial implant could never do. And, as new tissue forms to take its place, the biodegradable plastic will actually be absorbed by his body over the next three years, the biomedical engineer who led the work, Scott Hollister, told CBC. Dr. Green and Scott Hollister are already working on a patent pending for the device, though it may be some time before it is made available for the general public. Still, even just seeing an experimentation do this well, there are doctors who are impressed with the work, and hope to see it used in the future. “I’m impressed by what they were able to accomplish,” he told CBC. Dr. John Bent, a pediatric specialist at New York’s Albert Einstein College of Medicine didn’t go quite that far. He says that more time is needed to determine if the device will serve as a permanent solution. He did, however, praise the researchers for their ingenuity and perseverance. “I can think of a handful of children I have seen in the last two decades who suffered greatly…that likely would have benefited from this technology,” Bent told CBC.